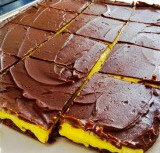 Some people call these NANAIMO BARS, as they are said to originate in the city of the name in British Columbia, Canada. So trust the Canucks to have shortened the name to something pronounceable... Naomi Bars! I like the shortened version, it does make me wonder who the famous Naomi is... but I do like the idea of a cake carrying someone's name... Hopefully there'll be a Jo Bar or cupcake someday ;-).These are three-layer no-bake bars that end up looking just great when you cut them into squares out of your baking tin, as they are chocolate on the bottom and top, and vanilla in the middle. You can also make them in individual round tins (like cupcake tins) like I have on the picture, although being a bar, they should really be square...(Yes, I am a purist!). They do take a little time to pull together seeing as the different layers each need to set for a while in the refrigerator before you layer the next one on top, so if you can't bear the wait, come on in and have one with us... they'll be waiting for ya! First layer first: melt the chocolate, butter and the sugar in the micro-wave or on a double boiler. Add the beaten egg, and warm a little more but not to a boil, then add the dry ingredients once off the heat. Pour the mixture in the tin and pat it down into all the corners, then place in the refrigerator for about an hour. Second layer: beat all the ingredients of the second layer together (I find it easiest to mix these with an electric whisk to get a good airy mixture) and then pour them over the first layer, and place the tin back into the fridge for about 30 mins. Third layer: by this time, you are really dying to try these out, so get cracking on mixing all the third layer ingredients together, and then pour that mixture, which will be a sort of chocolate sauce texture, over the rest. And then place it back in the fridge for the third and last time. The recipe calls for an hour, but if you have kids about, this will probably only last 20 mins at best. But you should be alright ;-). Now just cut them into squares, and M-Joy!